As agriculture reaches the halfway point of 2018, grain and dairy farmers continue to wade through suffering crop and milk prices and rising debts. However, net farm income may not be on the steep slide that the U.S. Department of Agriculture forecast in February. USDA’s initial forecast points to a 6.7 percent drop in net farm income from 2017 that would bring the total to $59.6 billion, and mark the lowest level since 2009. The early forecast trying to paint the financial picture in the midst of a time with many unknowns, including trade. 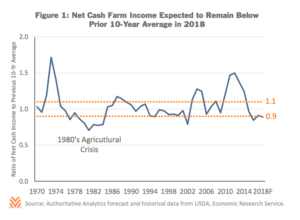 In an early exclusive from agricultural creditor Farmer Mac and economic consulting firm Authoritative Analytics, the summer edition of “The Feed” indicates net cash farm income is expected to stabilize in 2018, after levels steadied in 2017. The stabilization may be comfort for some in farming, but the reality is the forecast is still below the 10-year average, but above levels seen in the 1980s. Even with the multi-year slump in both crop and livestock prices, Farmer Mac says expenses on the farm remain high. In “The Feed,” Authoritative Analytics projects gross cash income to increase just shy of 2 percent in 2018. As the economy continues to heat up, that could also result in increased borrowing costs. According to “The Feed,” that could mean income on the farm will remain “range-bound” in 2018, and possibly better than USDA’s initial 2018 outlook. It’s 2017’s official financial numbers that will also be released in August. In anticipation, Authoritative Analytics’ May forecast for 2017 shows commodity receipts is $1.8 billion above what the firm forecast in April. That’s largely due to better soybean prices. Authoritative Analytics says those receipts were $1.3 billion above their April forecast. It’s also soybeans prices that largely offset weaker commodity prices from crops like corn and wheat. On the livestock side of the ledger, total livestock receipts are forecast $1.9 billion higher for 2017, lead by better revenues from the cattle side. Authoritative Analytics’ total cash expense forecast is $306.3 billion for last year, with net cash income expected to hit $104.5 billion – $7.5 billion above USDA’s forecast. Authoritative Analytics says it’s that strength that continues to also hint at a stronger year financially for U.S. agriculture than expected in 2017.